Forex Trade Setup: USD/CHF Retracement Near Parity! Mornin’! I saw an opportunity to buy the dollar when a bit of risk aversion in the forex markets took USD/CHF to a nice retracement level. China once again caused ruckus in the markets after the PBoC actively weakened the yuan for an eight consecutive day. The aggressive move encouraged panic-selling in China’s equities markets, enough to trigger a forced suspension only 30 minutes after the opening bell. Yep, 30 minutes. A House of Cards episode would’ve been longer (but no less dramatic). Traders flocked to low-yielding currencies like the yen and franc and pushed USD/CHF down just above its parity levels. 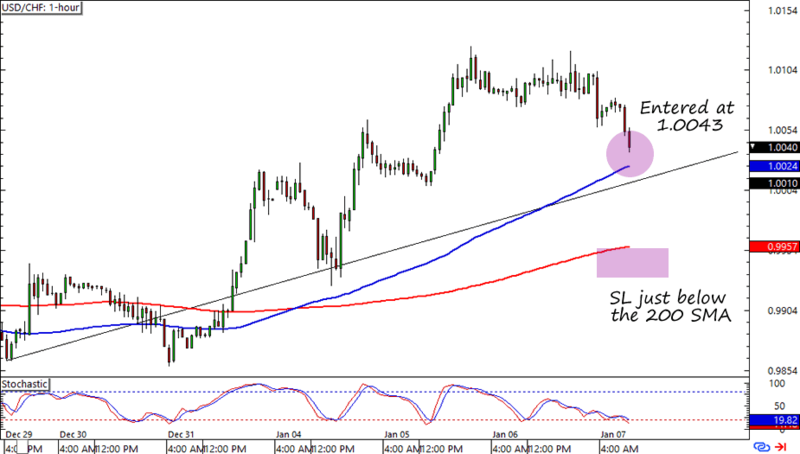 I saw an opportunity to enter at market when I saw USD/CHF approach the rising trend line support AND the 100 SMA on the 1-hour chart. It also didn’t hurt that Stochastic was almost at the oversold region. Since I promised to take more trades in my 2015 reflection, I decided to enter at market (1.0043) with a 100-pip stop. I figured this would place my stop to just below parity and the 200 SMA. Not only that, but it’s also half of the weekly ATR for the pair. I haven’t exactly pinned my profit targets yet but this week’s highs look good as starting points. Here’s what I did: Bought 0.5% worth at 1.0043 with my SL 100 pips away at .9943. I’ll check today’s volatility and determine if I can lock in some pips before tomorrow’s NFP report. Meanwhile, I got my eyes on possible profit targets. What do you think? Do you have any tips on how to handle these kinds of market-entry trades?